‘Yes,’ said Jase. He nodded, with the inclining of the head that was the Ruml gesture of respectful assent. The Keysman stopped staring. He pulled himself erect. He was an older Ruml, wearing a harness with many Honours clipped to it, and the hair of his upper body was almost uniformly grey. If this story, a half century old as I write this review, was required reading by all those who make war or negotiate for peace, I suspect there would be less war. Like all good stories about first contact with alien space-faring beings, it is not really about aliens. It is about people. People with some differences from us. To use a Daniel Dennett analogy, the aliens are just people with some dials turned right up and other dials turned right down. Kator bent his head in acknowledgement of the compliment. He saw that the Inspector who had just spoken wore the badge of the Hook party – like himself and all the Brutogasi. The Presiding Inspector, as well as the other senior, wore the emblem of the Rods. It occurred to Jason for the first time that perhaps the whole Panel had wished to express its approval of him – naturally, the Rods could hardly make such an expression. Jason glowed inside, and his lungs felt filled with fire. With one exception, which I describe under Criticisms, the story packs its punches into few words. For example, we are given no clue as to the difference between Hooks and Rods; it is irrelevant. Just like us, it seems that the Rumls instinctively form clans that compete with each other and erect walls of misunderstanding. Republican versus Democrat. Liberal versus Conservative. Hawks versus doves. And so on. That scene describes Rumls on their home world, in which Kator Secondcousin of the family of Brutogas, is the viewpoint character. Jason Burchar, the central human character, is a naturalist, an expert in bears. I hope that you do not notice – as I did not on first reading – that the second mention of Kator has his name misspelled Jason. It is not a typo. A crucial component of the story is the invention of a means by which the reader, via the viewpoint character, can share the experiences of another individual, whether human or, as here, alien. Perhaps surprisingly, I did not find it confusing either before or after I became aware of it. Kator Secondcousin and Jason Burchar are markedly different, yet they are both to some extent isolated from others of their respective races; a characteristic of many central characters in Dickson’s sci-fi stories. Like Dickson himself, I suspect, they tend to find themselves at loggerheads with their fellow beings, not because they are found lacking in some required physical or behavioural standard, but because they can see – by reasoning about a body of knowledge unfamiliar to others – what others cannot see. He stood watch alone, like a single armoured and sworded soldier of the Roman legions in a pass at night, facing north towards the German wilderness, the darkness and the sound of stirring hordes. The legions he guarded were all asleep in the camp behind him. He had never felt so alone in his life. The cover art illustrates a kind of fishing expedition in which a wrecked spacecraft serves as bait. If you have ever experienced an ‘alien’ moment wherein familiar things and actions seem barely comprehensible, you might appreciate this book’s presentation of Jason Burchar’s predicament. He woke, struggling and crying out. Hairless faces were all around him. Hairless hands were getting him to his feet and guiding him down fantastic corridors and into a cage that rose upward. It was fortunate, he went on thinking as he turned away from the screen, that the Ruml had not encountered this planet of the Muffled People first before landing on the other planets with alien, semi-intelligent creatures on them. The first, unsophisticated reaction of a race of men unused to the sight of alien life would have stimulated them to exterminate the Muffled People out of sheer revulsion. And that would have been other than honourable action. The Muffled People are us humans who, having no fur, wear clothes. The ‘race of men’ are the Rumls. The Rumls, unlike any other non-human species we know of, are people. Bear people. With hopes, fears, and ambitions. As soon as they were out of the pouch long enough to comprehend the concept of Honour, he would tell each of them, personally, of the man from whom the name they bore was derived. And of the part those three honourable men had played in the Founding of their father’s Kingdom on the planet of the Muffled People. Thunder muttered off in the distance, and the rain streamed down. Straightening up, he beat on the metal surface of the door with his fist as he swung it open. ‘Meter reader!’ he shouted and went into the hallway without stopping, letting the door bang shut behind him. ‘Right downstairs!’ shouted back a voice from the clattering, steam-bright kitchen entrance to his right. No one stepped out to look at him. Facing him was the figure of the native he had seen by the stream, but with the walls of a room behind him instead of the outdoor scene. The native took the container of burning vegetation from his mouth. Kator sprang from his platform. The sport of comparing the predictions of future technology embedded in sci-fi stories with the eventual reality is as applicable to Dickson’s work as anyone else’s. In 1965 the space program used the mainframe digital computer as a key element (at least in the USA) but the personal computer was an unknown concept. The Broker ran a practiced eye down the list and then turned to his computer connection and checked out the current values of the items on the list, worth by worth. When he was done, he nodded thoughtfully, typed out a total, and passed the list back to Jase. He should have been a diplomat. The story does not move as quickly as his later novels including the military sci-fi Dorsai trilogy, for which he is perhaps best known. Is it worth mentioning that any instinct that placed the well-being of the species, the nation, or the company ahead of that of the individual (and his or her close relatives) would itself be extinguished quickly by natural selection? 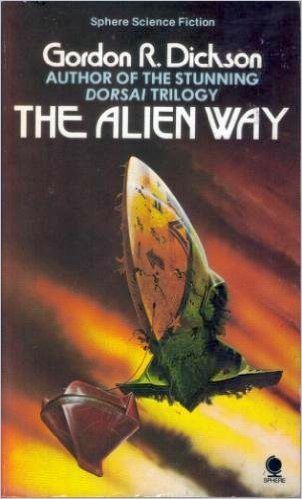 However, bear in mind (no pun intended) that The Alien Way was written more than ten years before Richard Dawkins’ The Selfish Gene was published and clarified what, in retrospect, seems obvious. A second, alien, viewpoint seen through the eyes of the primary viewpoint character might sound like a narrative disaster. (In my view, multiple viewpoints in written stories – unlike in films – ordinarily destroy the ‘suspension of disbelief’ necessary to this kind of fiction.) However, Dickson’s technique carries it off perfectly, even when stretching it by deliberately referring to Jason when he means Kator — because, by using an advanced technology, we experience Kator’s life via Jason. It is an extraordinary story by one of the greatest writers.